His Holiness Orgyen Kusum Lingpa is a meditation master from Tibet. He has visited the United States one to two times a year since 1994. He was born and still lives in the Golok region of Eastern Tibet. He is renowned as a great meditation master, teacher and doctor of Tibetan medicine. From an early age His Holiness showed remarkable understanding of complex rituals and sacred texts. He has had many visions — face to face encounters — with such enlightened beings as Padmasambhava and the bodhisattva Vajrapani. Over his lifetime he has studied with over 150 great masters of the tradition without sectarian bias and has received instruction from all the major schools of Tibetan Buddhist meditation. In Tibetan His Holiness is called a terton or treasure finder. Padmasambhava, the 9th century adept who helped found Buddhism in Tibet, hid sacred texts and other objects in the earth, water and sky in order that future generations might have teachings and practices appropriate to their era and circumstances. At the appropriate time, these ‘treasures’ would be revealed by treasure finders who were emanations of his closest disciples. In this way the scriptural tradition is refreshed and updated across history. His Holiness has revealed over fifty volumes of such texts. At least two texts were discovered in the U.S.
His Holiness is also widely known as a healer whose activity has brought physical and spiritual restoration to tens of thousands. One of his recent accomplishments is the construction of a monumental stupa at the location of his monastery in Golok. A stupa is a Buddhist form of sacred architecture; its shape is a symbolic representation of the mind of the Buddha. Construction of a stupa brings to the earth many blessings and diffuses negative energy. His Holiness has had recurring visions in which Padmasambhava and Vajrapani instructed him to construct a very large stupa which would bring protection from war, disease and famine to the whole world. This stupa was dedicated late last year, a gift to the world entering a new millineum. It is over 67 meters long per side and is the largest in Asia. His Holiness is friendly, accessible to strangers, and teaches in an engaging and memorable way. Sometimes his teaching style is utterly serious, imbuing his students with clarity and introspection. Other times he is full of mirth and entertaining stories. After teachings, he usually spends time meeting people, bestowing blessings and openly showing love and heartfelt interest for others. Ordinary people, with no other connection to Buddhism, are immediately struck by the upbeat quality of his energy and his effulgence. I have great respect for such wise persons and a desire to venerate and promote them. Please send me info on any opportunities to meet and help H.H. 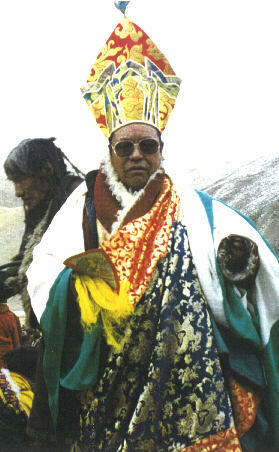 Orgyen Kusum Lingpa. I live most on the year in my Master’s ashram in southern India and other times I am in New York.